One of my favorite pieces! 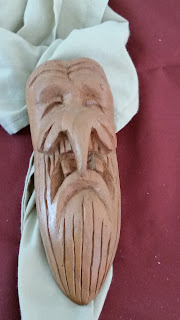 Carved from red maple it was made using a rotary tool with a saw bit and my knife. Lots of sanding in this one too. A couple of coats of clear poly and a wooden loop glued to the back.